INOR Process AB has announced a new way to configure and monitor temperature transmitters without supply voltage and cables. Operators can connect to the transmitter with a smartphone or tablet using near-field communication (NFC) or Bluetooth and configure through the new INOR Connect app. Using wireless communication means operators never need to remove the signal converter from the process. Now available are the INOR 330 series temperature transmitters, and the INOR 530 series, fully compatible with HART 7. 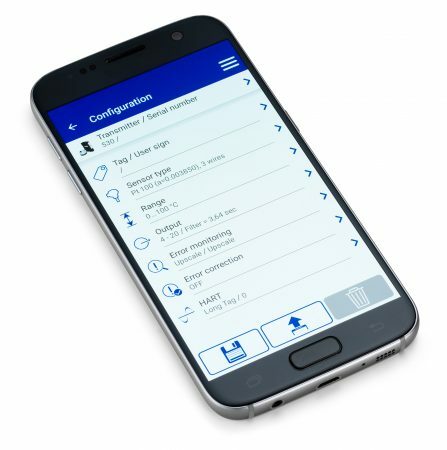 With the intuitive and easy-to-use interface of the INOR Connect app, configuring a transmitter has never been easier. INOR Connect offers the same great configuration options as INOR’s existing ConSoft transmitter software, but with an even more user-friendly interface. INOR Connect offers automatic updates, so users will always have the latest available features. The app also has quick links to product pages for a wide range of signal converters. INOR Connect is available for Android and iOS devices (Bluetooth only). The IPAQ 330 and 530 series are fully isolated and compatible with RTD, thermocouples, voltage and potentiometer sensors, offering maximum flexibility. Fully compatible with HART 7, the INOR 530 series offers extended diagnostic information, making it reliable and highly precise.